Illustrative Feature 01 is a bedrock ridge with significant frost heave and glacial features. The photo above shows the gap left behind when a frost-heaved joint block was carried away by glacial ice. Frost-heaved bedrock is usually regarded as a periglacial phenomenon, occurring in unglaciated regions subject to polar climate conditions. The observations of Illustrative Feature 01 (IF-01) are intended to show another type of environment that also supports development of bedrock frost-heave features. 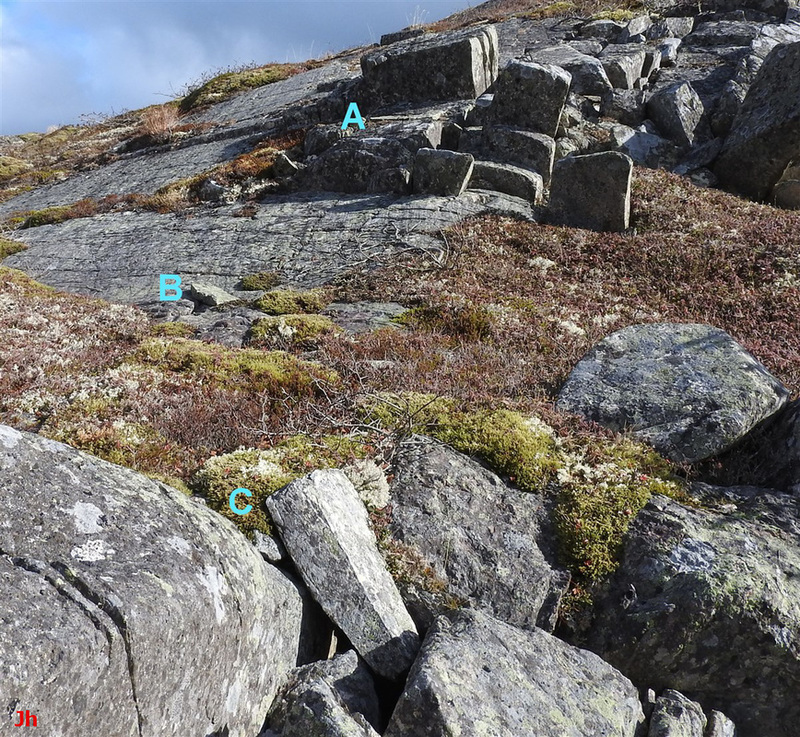 The observations presented below suggest a direct association between glacial activity and the occurrence of bedrock frost heave at this one selected location. The goal is to demonstrate that bedrock frost heave occurred underneath glacial ice and that under-ice bedrock frost heave resembles glacial plucking. An underlying conceptual model guides interpretation of the observations presented below. Within this model, the ridge IF-01 was shaped and smoothed by intense basal-slip erosion at the end of the Wisconsin, but then the final stage of deglaciation was interrupted by a suddenly cooling climate. On the lee side of the ridge, frozen bedrock underlying thin, cold ice cover was disrupted by frost heave, the frost heave process being caused or amplified by the presence of artesian groundwater. Artesian groundwater was supplied from underneath steeply-sloping upstream glacial ice where sufficient ice thickness precluded freezing at the ice-bedrock interface. While the relatively thick glacial ice upstream from the ridge remained warm-based, the thinner glacial ice overlying the lee side of the ridge was cold-based. As frost-heaved (plucked) features arose under thin cold-based glacial ice, they were shifted by ice creep, but only to a small extent, thus allowing partial reconstruction of the events. Illustrative Feature-01 is a bedrock ridge showing clear evidence of extensive basal-slip glacial erosion. Ice flow direction is indicated by striations at several locations. The ridge IF-01 is aligned such that moving ice crossed the ridge at a steep angle to the long axis of the ridge. Plucking would be expected on the lee side of the ridge, and this is observed, but to a limited degree. Some basic geographic information on IF-01 is given in the illustrations below. The ridge selected as IF-01 is shown in a high-altitude airphoto (first, upper left) above, and then (second, upper right) viewed from the north-east (up ice) and finally (bottom) viewed from the south-west (down ice). In the bottom photo, the ridge extends diagonally across the center of the picture. The peak height of the ridge above the average height of the surrounding lower ground is about 11 m. The ridge is roughly 170 m long and 40 m wide. The outline of the ridge as indicated in the airphoto is a contour lying approximately 10 m below the peak height. Ice flow direction of 255 deg. 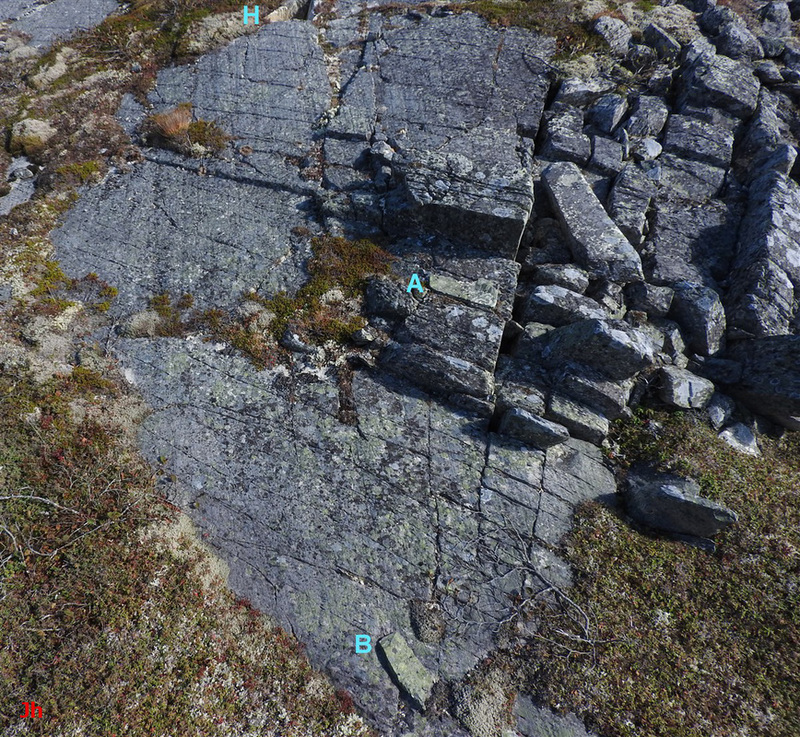 true was determined at three locations from distinct glacial striations. 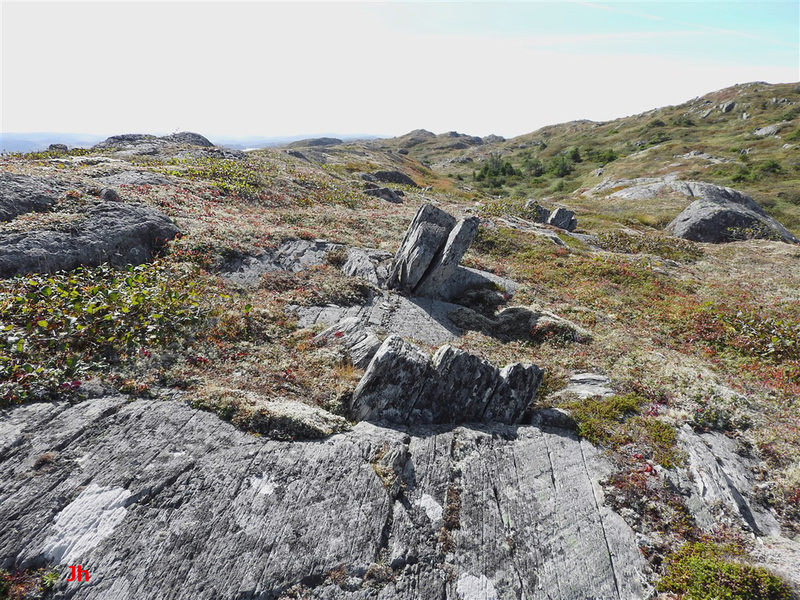 One location was on a bedrock quartz exposure about 0.5 km north-east of the ridge, while the other two locations were grooves etched in volcanic rock on the ridge, separated by about 100 m. All three ice-flow direction measurements agreed within +/- 2 degrees. The rock on the ridge is volcanic, a mix of tuff and ignimbrite. The rock is schistose and shows pronounced longitudinal tectonic cleavage (strike 20 deg. true). 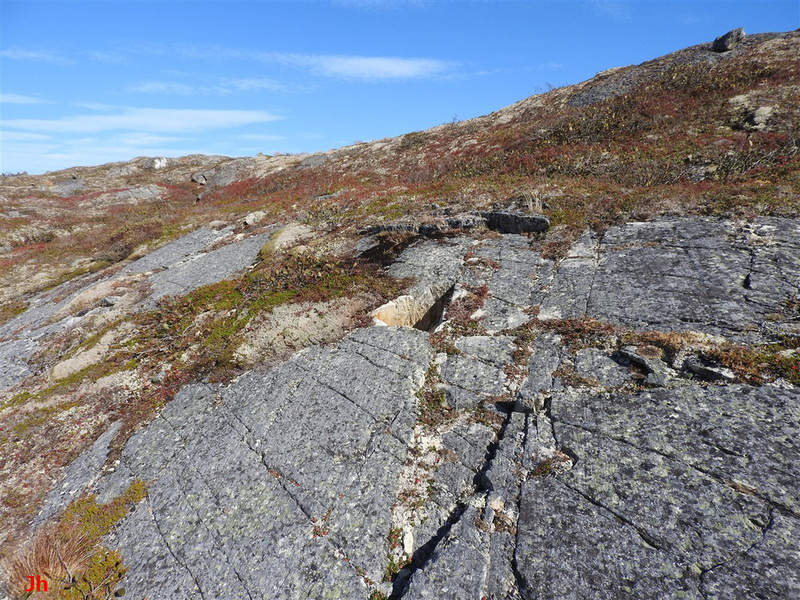 The dip of the cleavage was not measured, but was estimated at about 60 degrees (cleavage is evident in outcrops seen in bottom photo). 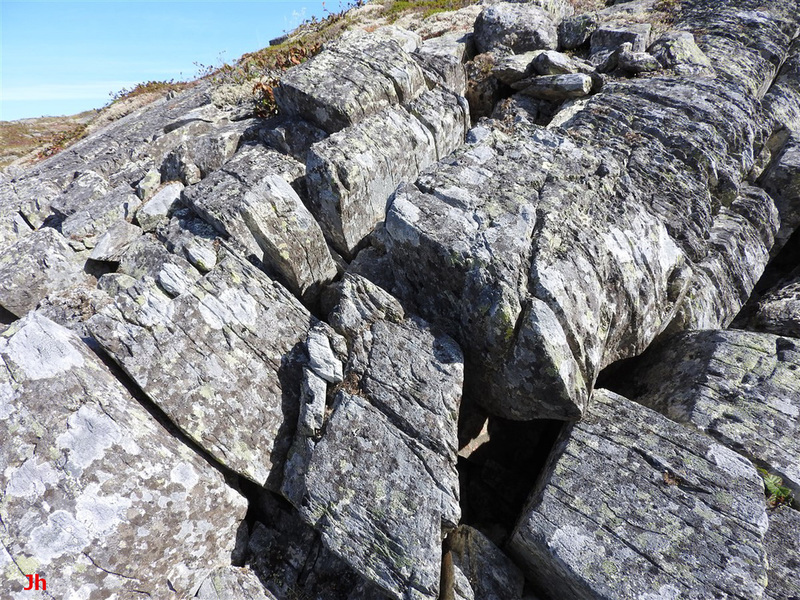 A well-developed system of cross joints was observed in all areas of exposed bedrock on the ridge, with the joints having several different strike directions. Pronounced vertically-dipping cross joints, striking at 90 deg. to the longitudinal cleavage, were observed in several places. 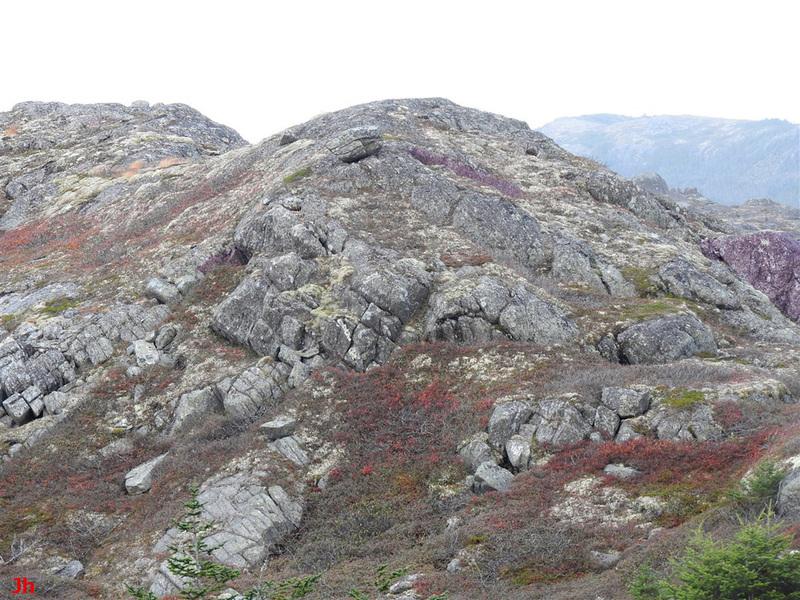 Frost-heaved joint blocks occurring at the top of the ridge IF-01, near the middle, are shown in the above photo. Glacial striations are visible in the foreground. The left and right surfaces of the joint blocks follow longitudinal cleavage, while the front and back surfaces follow cross joints orthogonal to the cleavage. 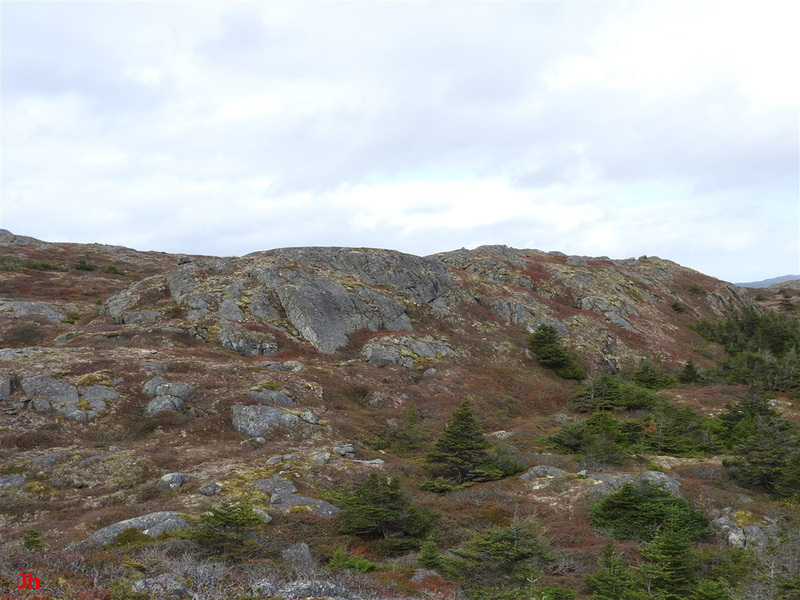 The above photos show ice-disrupted bedrock on the west side of the ridge. 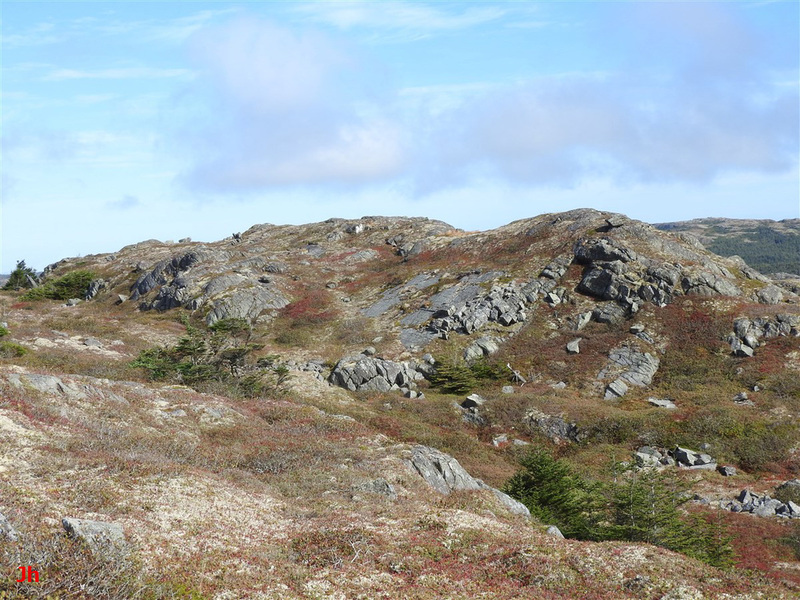 The second (right) photo is a detail of the frost-heaved bedrock feature appearing at the left edge of the first (left) photo. The hammer is 27 cm long. 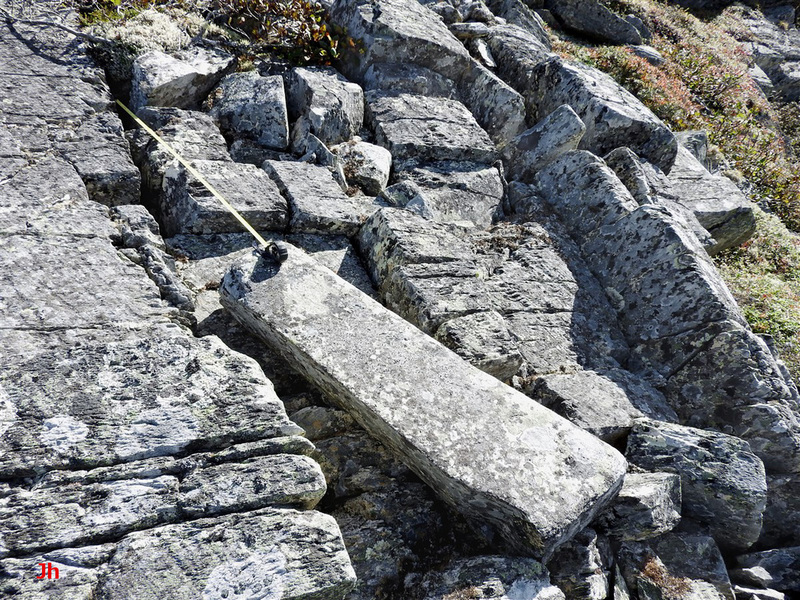 Note that a block of bedrock has been pushed entirely out of the ground and has toppled over. This feature, along with the rocks appearing just right of center on the first (left) photo hint at glacial plucking action (hydraulic bedrock frost heave, Technical Note 5) instead of conventional frost heave. A view of the south-west side of the ridge (IF-01) is shown above. At the extreme upper left is the bedrock frost heave feature illustrated in the two previous photos. Careful inspection (top edge, third the way over from left) also reveals the frost-heaved joint blocks previously pictured near the top of the ridge. The main area of interest in the present instance is seen just above and to the right of the center of the photo. 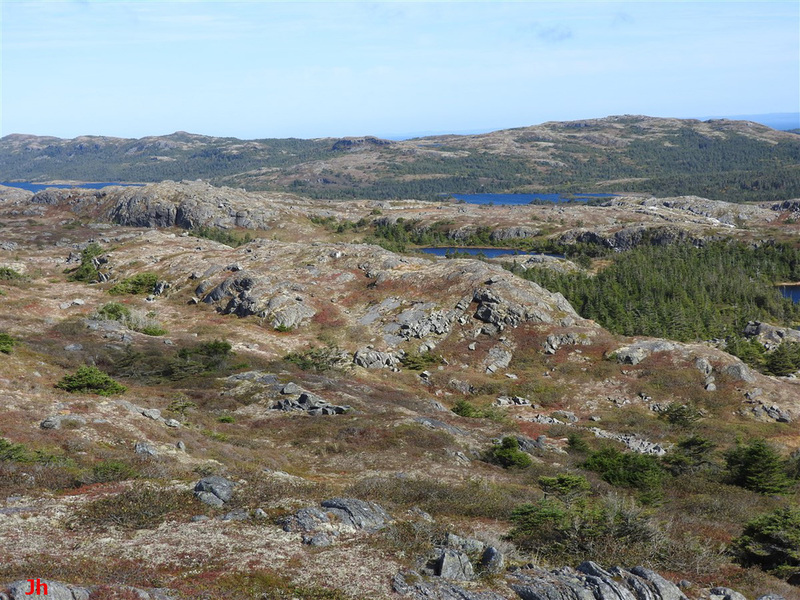 This area comprises exposed, glacially-smoothed bedrock and a nearby outcrop of highly ice-disrupted bedrock. This primary area of interest is referenced geographically on the previously presented airphoto, where it is shown as a green dot. Glacial ice flowed approximately toward the camera in the scene depicted above. A closer view of the main area of interest is given is the photo above. 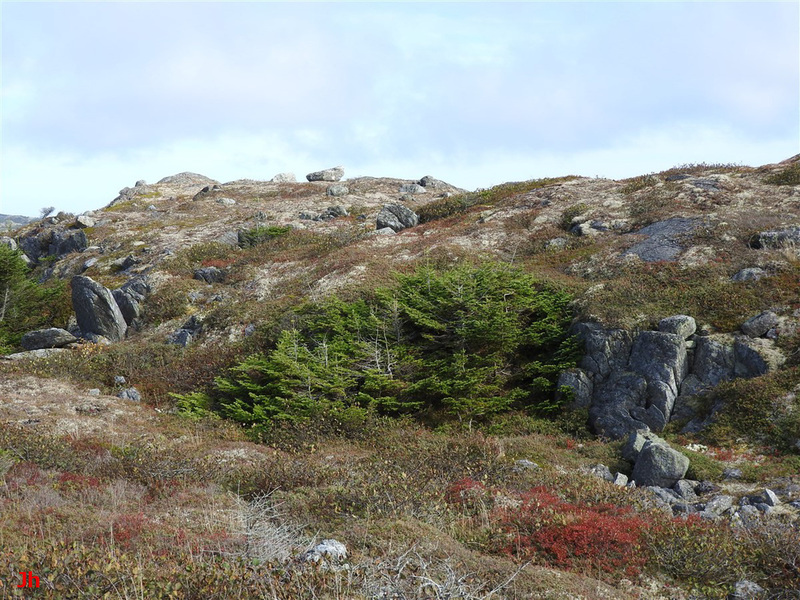 This is the south end of the ridge, viewed from the west, looking east. Ice flow direction is indicated by the striations visible on the glacially-flattened bedrock. Ice was moving toward the camera. The hilltop stands about 11 m above the camera at this point and the field of view is about 20 m wide at the middle of the photo. Two identical overhead views of the area of interest are provided above to help locate and illustrate some of the main glacial/ frost-heave features that will be discussed in more detail following. Blue numbers used in the following descriptions refer to the above picture. 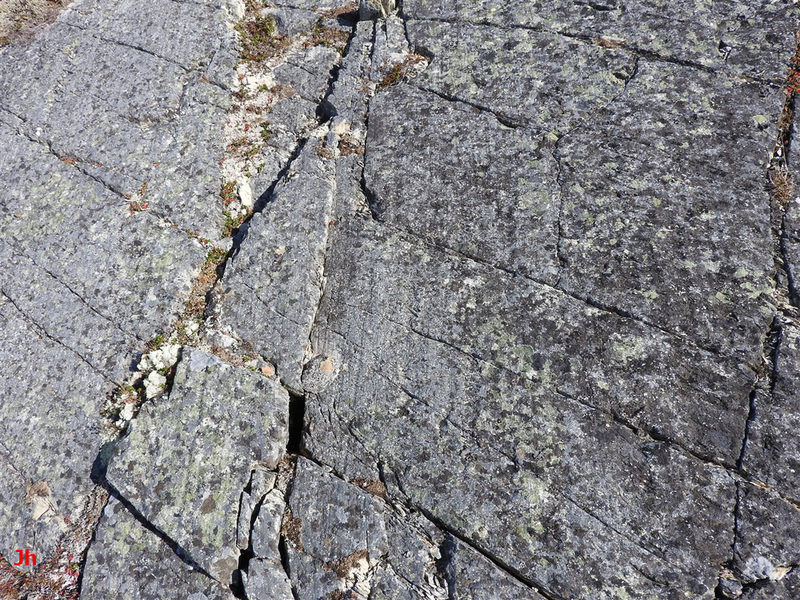 The above photo highlights the striations on glacially flattened bedrock (1). The smoothed bedrock surface has been disrupted by frost heave, yielding the small (a few cm high) step-changes in level, as seen. Ice flowed toward the camera (downhill). The set of four pictures shown above provides different views of a hole (2) in bedrock left behind after a joint block was dislodged by ice. The feature can be discerned, upon close inspection, just above and to the left of center in the first (zoomed out) photo. The last (bottom right) photo shows broken rock debris and peat at the bottom of the hole. 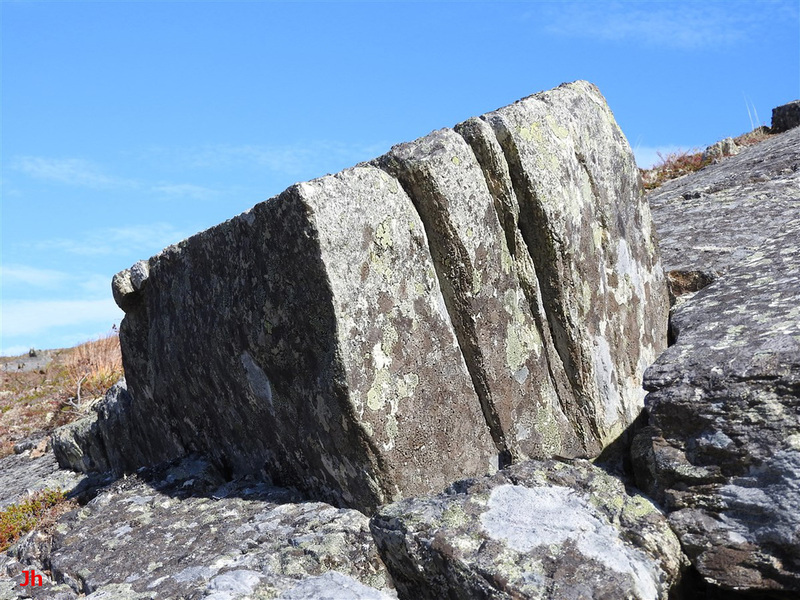 This displaced frost-heaved bedrock feature is significant because it demonstrates unambiguously that a joint block, after being dislodged from substrate, was transported a significant distance by subsequent horizontal motion. The dimensions of the displaced block could not be measured (block was missing), but could be inferred from the size of the hole left behind. The dimensions are indicated in the diagram below. 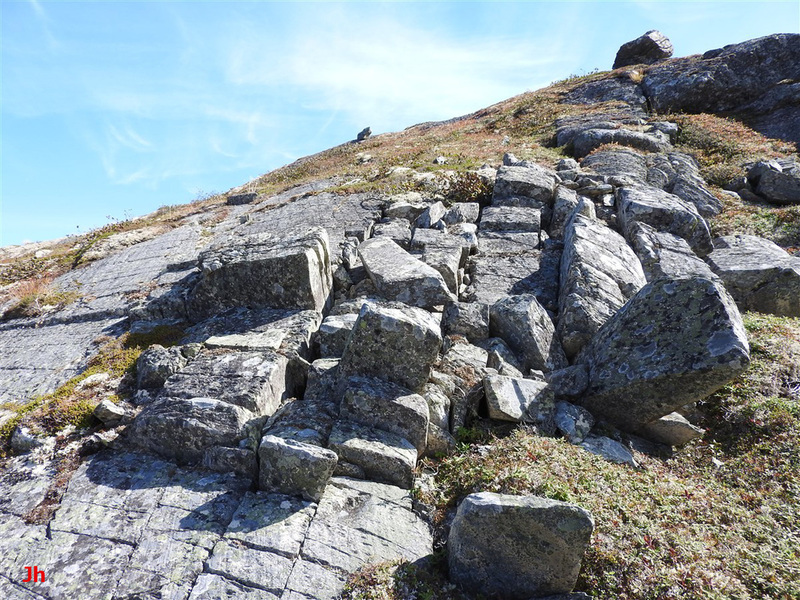 After thoroughly examining the area downhill from the hole where the joint block had been lifted out of bedrock, it was concluded that simple downhill sliding did not account for its motion. The slope of the hill (22 deg.) is indicated in the third (bottom, left) diagram above. 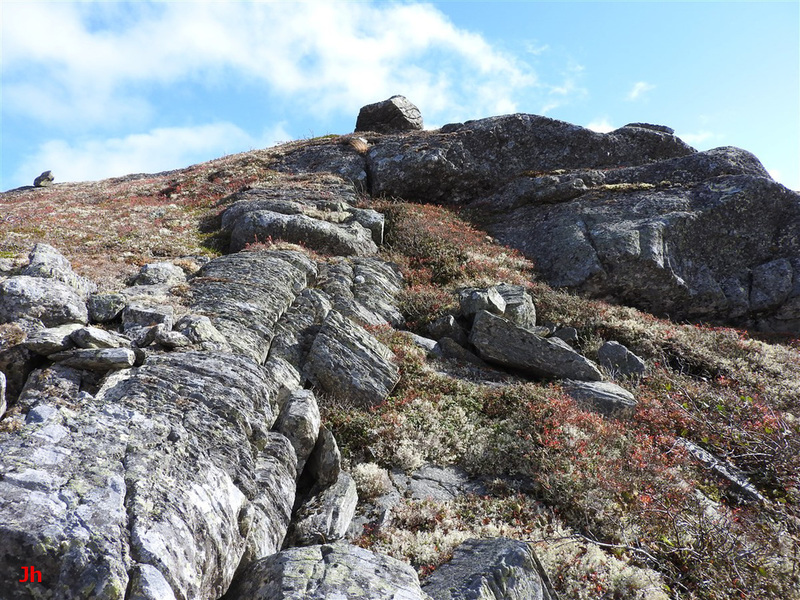 This slope was not sufficient for a rock to slide spontaneously, unless the ground was covered with a thin, uniform layer of ice. The fourth (bottom, right) photo appearing above shows blue letters indicating the hole (H) where the missing block originated and three possible fragments (A,B,C) from the block. 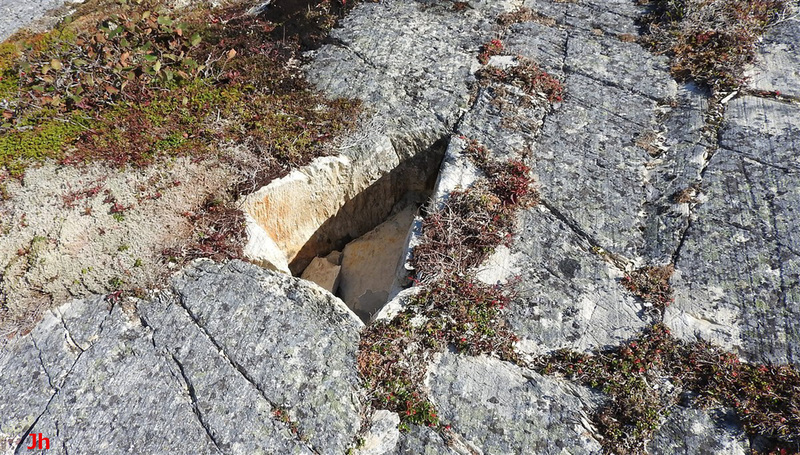 The maximum dimensions of the fragments fit within the dimensions of the hole and the rock type (light colored, fine grained volcanic tuff) matched the bedrock surrounding the hole. The rock match was significant because most of the rock in the surrounding area was distinctly different. Four photos showing details of the possible fragments appear below. 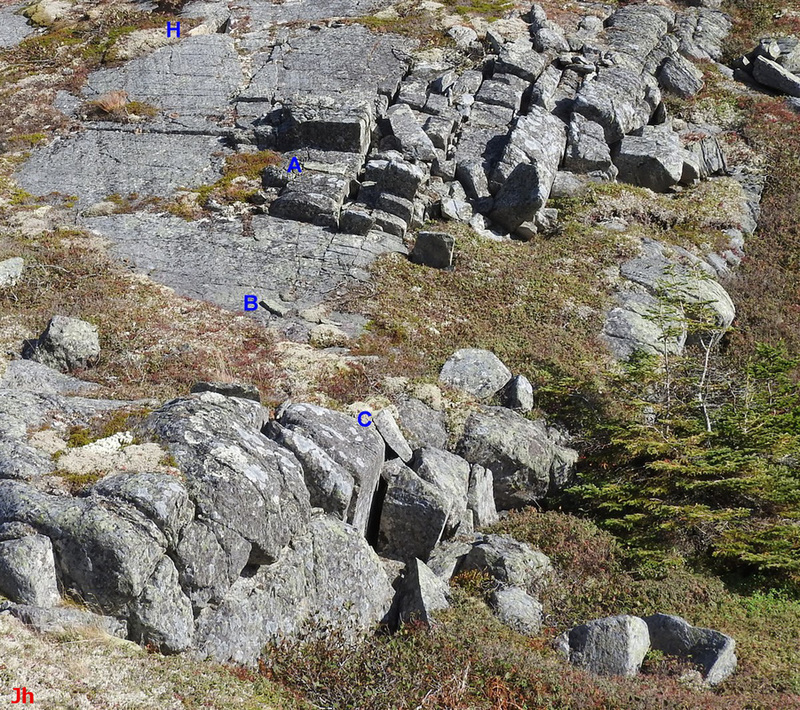 The first (top, left) photo above shows an overhead view with two fragments (A,B) standing out from the surrounding rock because of their different lichen coloration. 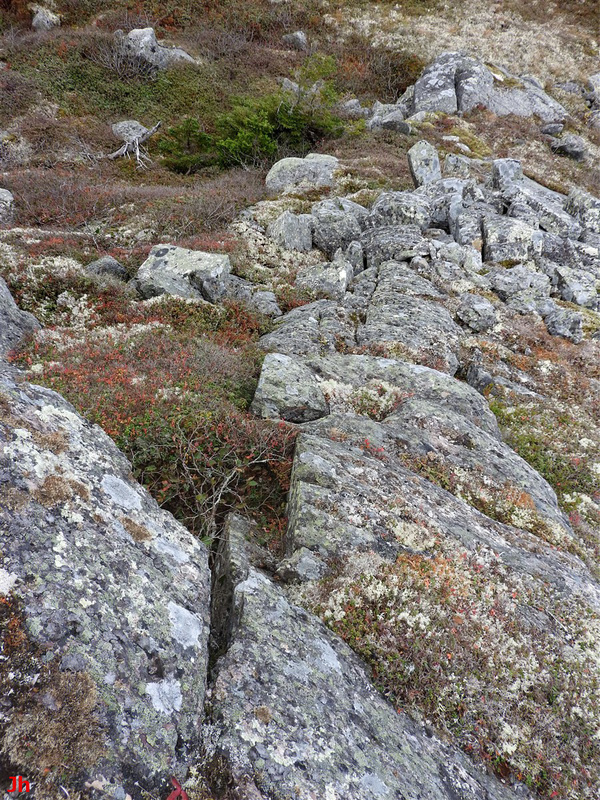 The lichen difference may be caused by a different thermal or moisture environment where these fragments are thin and not connected to the underlying bedrock. 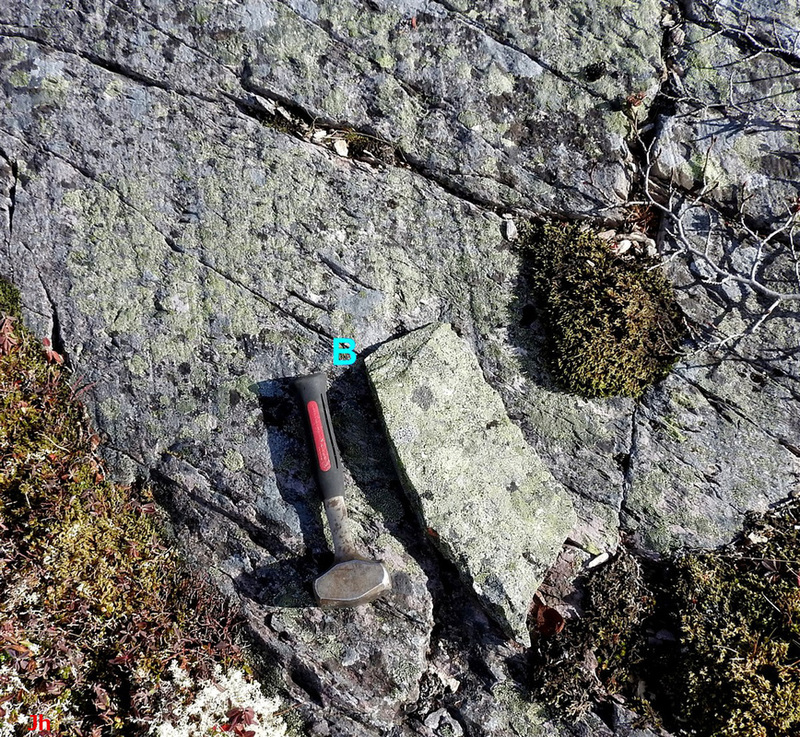 Note that striations are visible and that fragment (B) lies directly down ice from the hole (H). A check of bedrock beneath the fragments showed clear "shadows" of the fragments with no lichen coverage, indicating the fragments had not moved recently. The other three photos show the individual fragments. Piece (C) is 45 cm long, piece (B) is 36 cm long and piece (A) is 48 cm long. Fragments (A) and (B) average about 2 cm thick and are very thin and fragile on some edges. The displacement of the fragments from the hole (H) are: (A) 4.1 m, (B) 6.8 m, (C) 9.4 m. The fragments closely resemble fragments left behind at the bottom of the hole (see photo earlier in this section). The main part of the missing joint block from hole (H) could lie under vegetation past the position of piece(C) or it could have broken up completely. The possible fragments lying down ice from the hole (H) support the case for the displaced block or its pieces having been relocated along the same line as the glacial striations. It was thus concluded that transport by moving glacial ice was the likely cause of the joint block's disappearance. 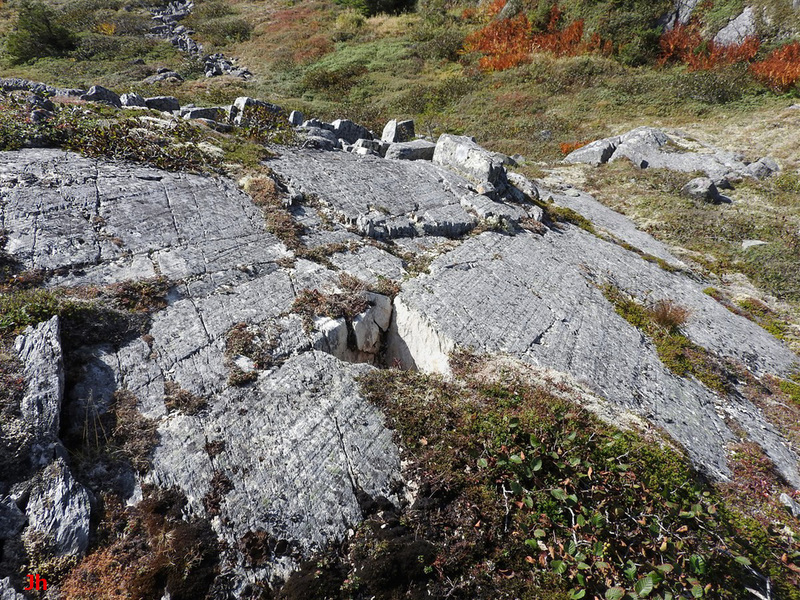 This opened up two possibilities: 1) Conventional frost heave occurred under bare ground or under trivial ice cover and subsequently glacial ice overran the site, relocating the frost-heaved block. 2) The block was displaced upward and transported underneath moving glacial ice cover (hence plucked, see Technical Note 5). The short transport distance and fragile nature of the fragments supports possibility 2, with creep-only (cold-based) glacial ice motion. 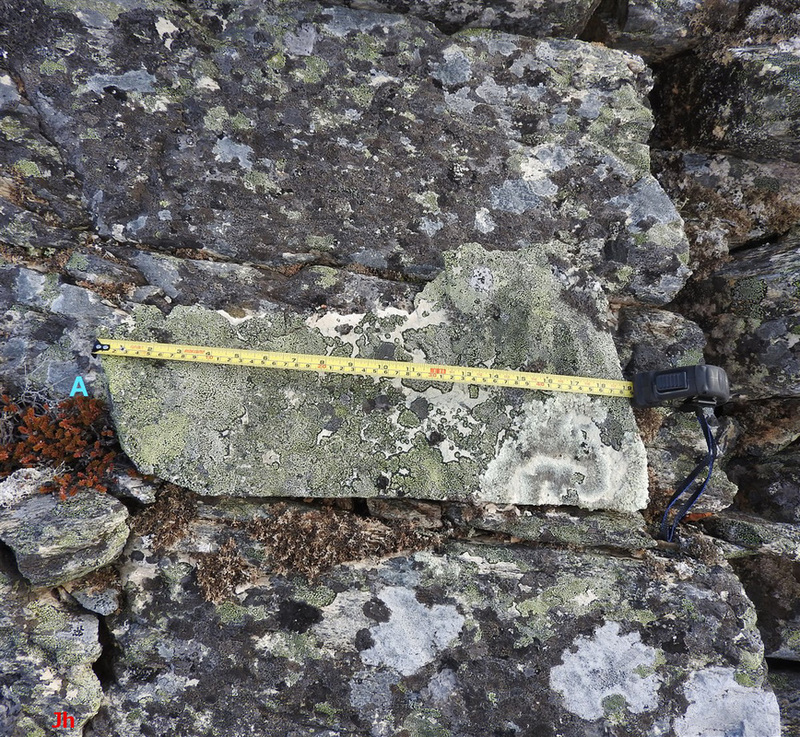 The above photo shows joint blocks lifted up less than 10 cm high by frost heave but not otherwise shifted. These blocks are similar in size and shape to the missing joint block discussed above and are located close to the empty hole. The gap visible to the top right of the lower raised joint block is 37 cm deep. 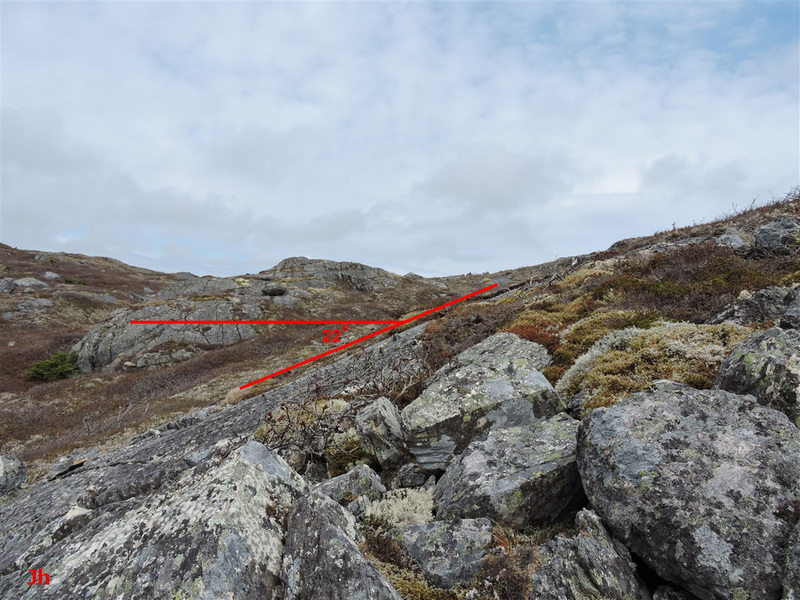 The second (right) picture above shows a frost-heaved joint block (3) located 3.3 m downhill (south-west) from the location of the previously-discussed hole (2) with the absent joint block. The first (left) picture shows the same block seen in the second picture, but viewed from uphill. The hammer in front of the block is 27 cm high. This ordinary-looking frost-heave bedrock feature is highlighted to show the close association between conventional features like this, and the contrasting glacially shifted features also seen at this site. The hammer seen in the above photo lies on a frost-heaved joint block (4) that has been lifted entirely out of the ground before tipping over. The original bottom end of the block is the end lying nearest the camera. This block is of interest because it was displaced only a short distance from its point of origin and thus its motion can be reconstructed. The measuring tape in the photo above extends from the bottom of the toppled frost-heaved joint block (4) to its possible point of origin. The tape is extended 1.2 m. At the upper end of the tape there is a deep rectangular hole roughly matching the dimensions of the displaced block. 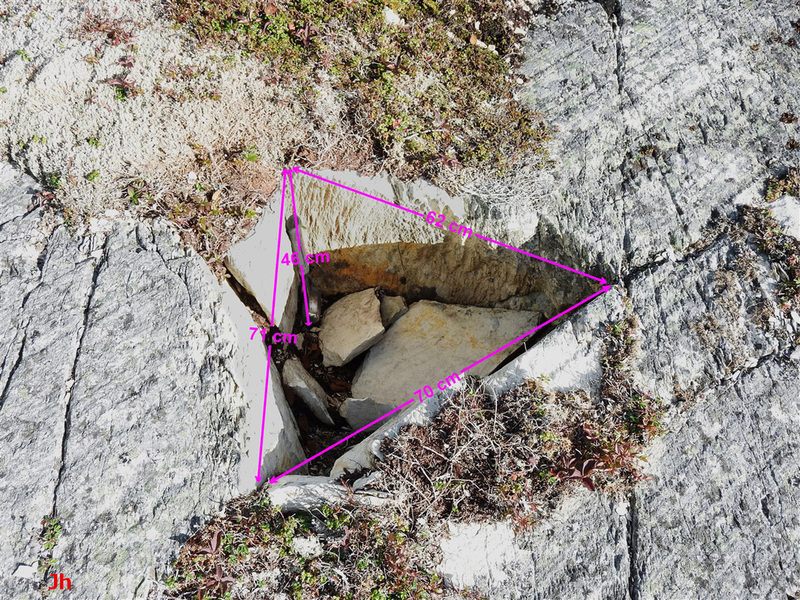 The tape touches the back of this hole, part of which is concealed beneath a substantial chunk of shifted rock. In the following list of dimensions, length (depth) is the longest dimension, width is the dimension in the plane of the ground (for the toppled block) and normal to the direction of the tape (for the hole), while thickness is the dimension normal to the ground (block) and aligned with the tape (hole). Dimensions: Hole -- depth = 92 cm, width = 27 cm, thickness = 23 cm. Block -- length = 110 cm, width = 27 cm, thickness = 18 cm, weight = 140 kg. ​ The ends of two other joint blocks are visible under the center portion of the measuring tape. These blocks appear to be similar in dimensions to the displaced joint block. It is possible (if not probable) that the displaced block originated from a position in front of the two intermediate blocks and that these two blocks were then pushed forward to their present location by ice pressure. In this case, the displaced block lies with its bottom end positioned about 30 cm from the point of origin. The displaced block lies with its long axis oriented in near-exact alignment with striations on the surrounding bedrock. This might reflect alignment by ice motion or it could be a coincidence. 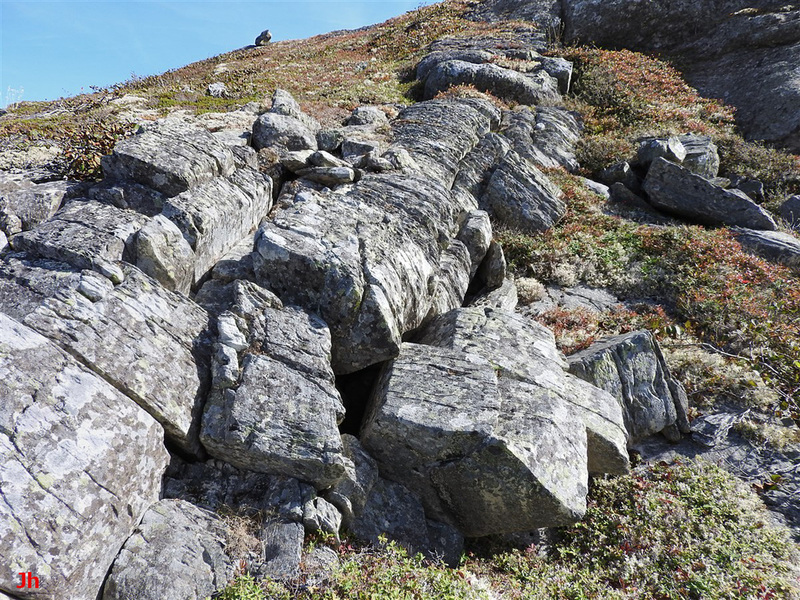 In balance, however, it appears that the displacement of the joint block cannot be attributed entirely to frost heave and that this feature is another indication of frost heave and glacial activity working in tandem. 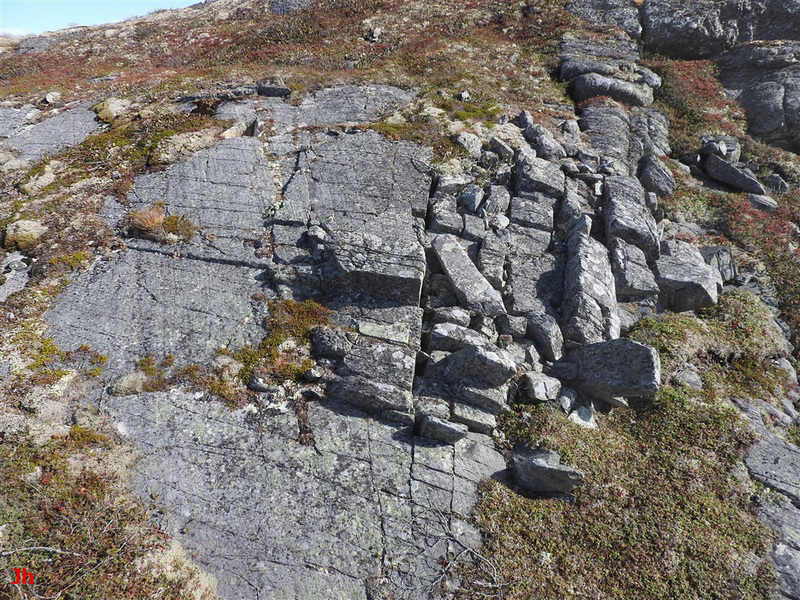 Several long fissures extend in a roughly east-west direction, running downhill through frost-disrupted bedrock in the main area of interest on the west side of ridge IF-01. The first two photos show a fissure (5) running through blocks of frost-shifted bedrock (second picture is a closeup of the lower end), while the bottom photo shows a row of frost-heaved joint blocks with the edges facing the camera being aligned along a fissure. The two illustrated fissures run parallel to each other. The fissures are frost-widened joints and potentially indicate the paths taken by groundwater feeding the bedrock frost-heave features. The fissure (5), viewed from near the top of the ridge looking downhill (west) in the first photo above, is particularly significant. 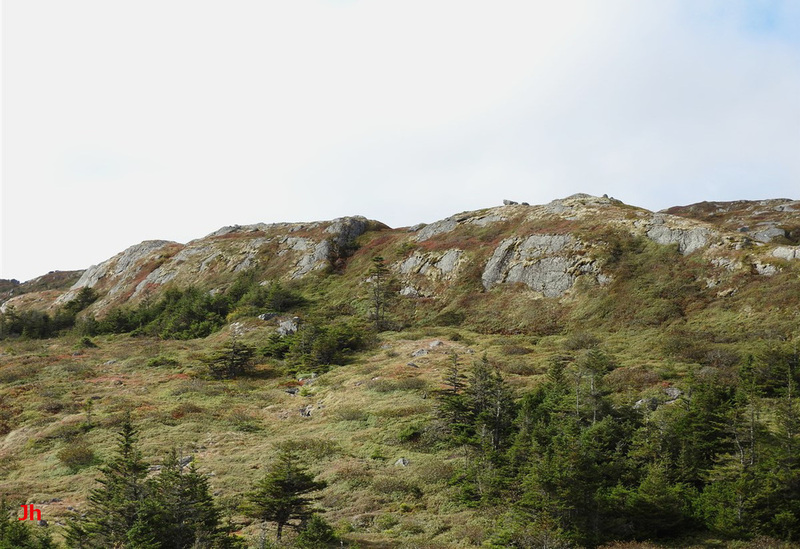 The joint on which this fissure lies extends across to the east side of the ridge and is associated with a prominent failure plane on that side. This will be discussed further near the conclusion of this section. 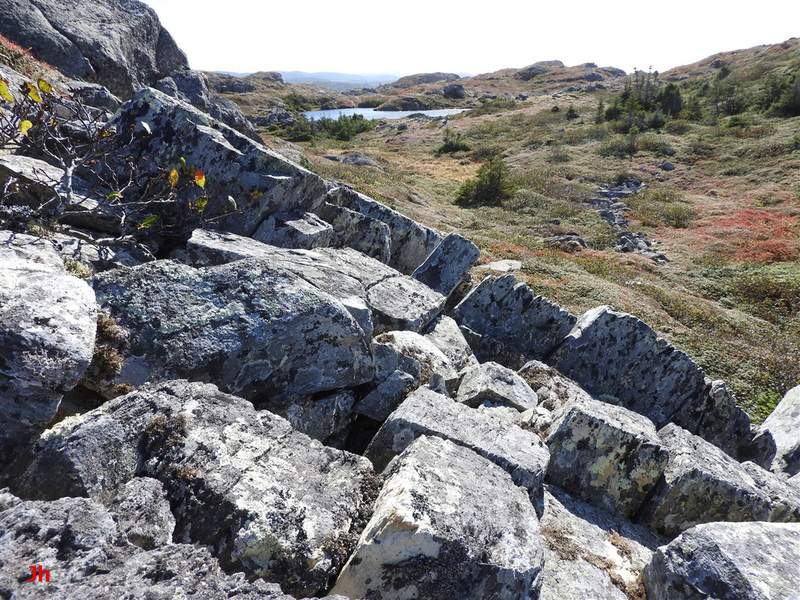 Ice-disrupted bedrock (6), including multiple frost-heaved joint blocks and fissures, is shown in the above photo. This area lies along a set of major frost-widened cross joints one of which, as mentioned above, visibly extends across the ridge to the east (up-ice) side. Groundwater conducted westward through these cross joints could have been instrumental in driving the frost-heave process which disrupted this rock. 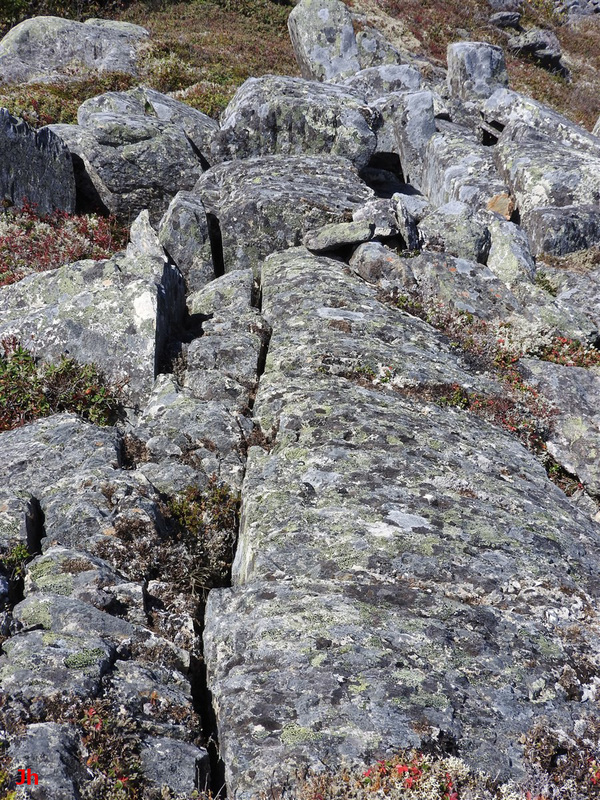 The frost-heaved joint blocks (7) shown in the foreground of the above photo have been displaced to the right while also being lifted upward. This sideways displacement is seen in most of the frost-heaved blocks in this area. The displacement is consistent with the possibility that glacial ice flow shifted the blocks while they were being lifted vertically. The large tilted joint block (8) seen right of center in the above photo also appears to have been pushed sideways to the right by horizontal ice motion as was suggested in the case of the two blocks (7) mentioned just previously. The smaller block to the left of the block (8) is tilted against ice flow, but this block was examined and found to have been levered into a tipped position by the larger block. The hammer (27 cm long) seen in the above photo is beside one of two small and relatively fragile frost-heaved joint blocks (9). It is assumed that these features would not survive basal-slip ice motion although they might survive limited ice creep in a cold-based glacial environment. Both blocks have been pushed sideways in a direction away from the camera, consistent with the sideways shift seen in other frost-heaved blocks in this area. Evidence from the site IF-01 suggests that bedrock frost heave was occurring underneath glacial ice at this location. Overlying glacial ice blunts the thermal gradient normally associated with powering bedrock frost heave processes. Hydraulic action, whereby pressurized groundwater initiates or accelerates bedrock frost heave, may help explain frost heave in an under-ice environment. Pressurized groundwater, if present in bedrock, would move along joints from an upstream source (presumably a glacier at elevation) to an area where near-surface bedrock can be forced to yield in tension. The bedrock in the region around the ridge IF-01 possesses a well developed system of joints. The rock can thus be regarded as potentially permeable to groundwater everywhere. A prominent cross joint traverses the primary area of interest on the south-west side of the ridge IF-01. 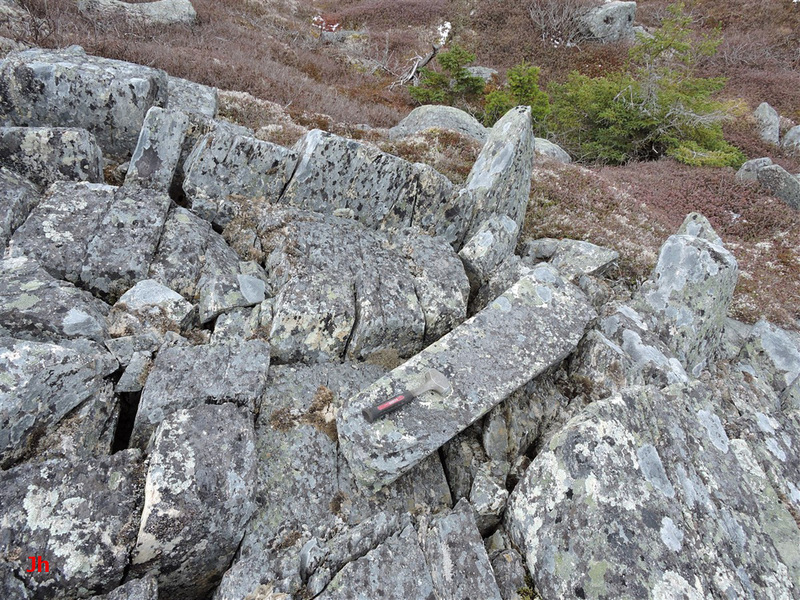 This joint is clearly indicated on the south-east side of the ridge by a failure surface where evidence of a quartz intrusion shows that the joint extends to depth. The joint crosses the ridge and widens into fissures and frost heave features on the west (down-ice) side. This major joint could have provided an efficient pathway for groundwater to reach the main location of bedrock disruption. The east side of the ridge is shown above, viewed from the south-east. A small cliff is visible extending uphill just left of the center of the photo. 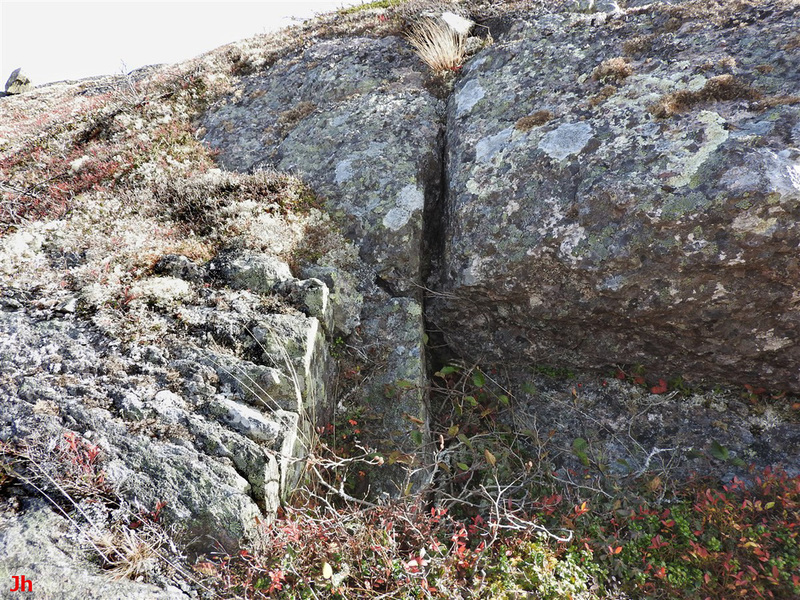 This rock face was cleaved off by glacial erosion exploiting a vertically dipping cross joint. 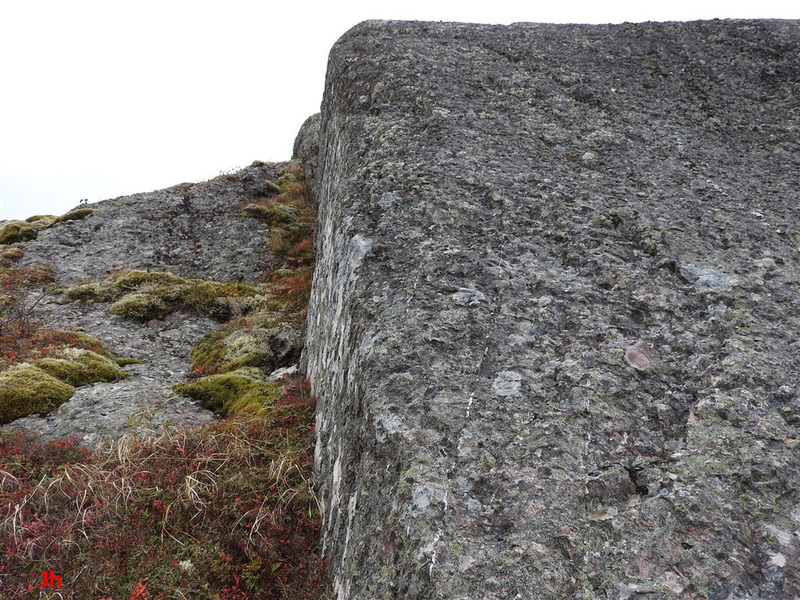 An edge-on closeup of the vertical rock face is shown below. 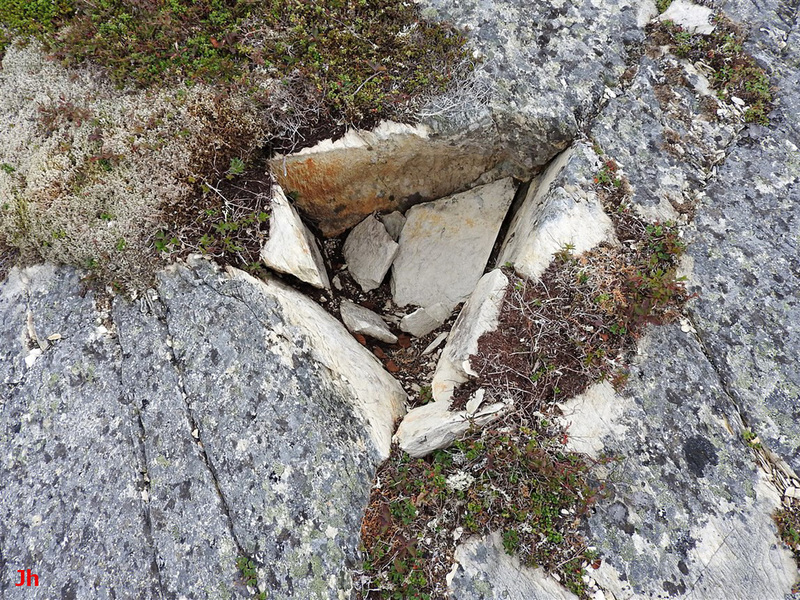 The white markings on the vertically dipping joint surface appearing above are the remnants of a quartz vein that was mostly scraped off by glacial erosion. The joint revealed by the failure surface shows clear evidence of extending west and traversing the ridge as indicated in the following overhead photo. 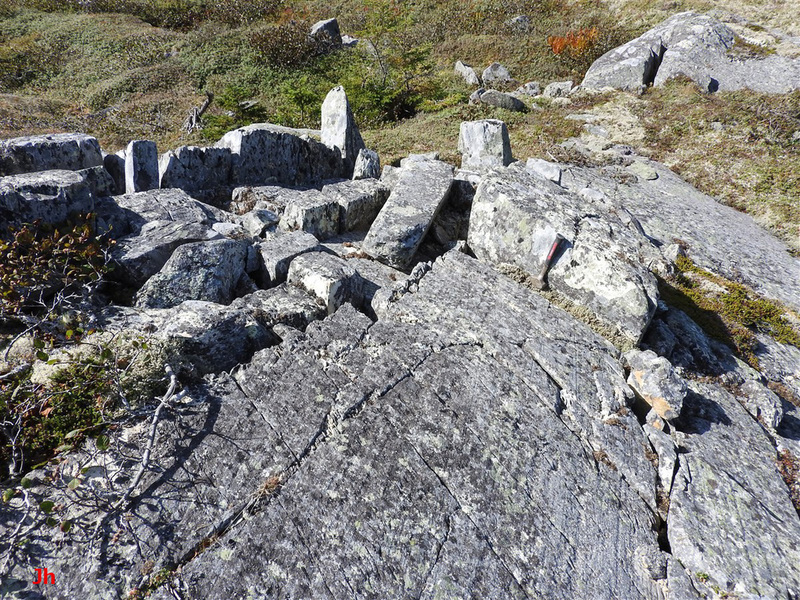 The above picture was taken from directly over the center of the south end of the ridge, looking down on the major cross joint discussed above. North is up on the photo. At the right (east) side of the picture is the failure surface shown in the previous photo. 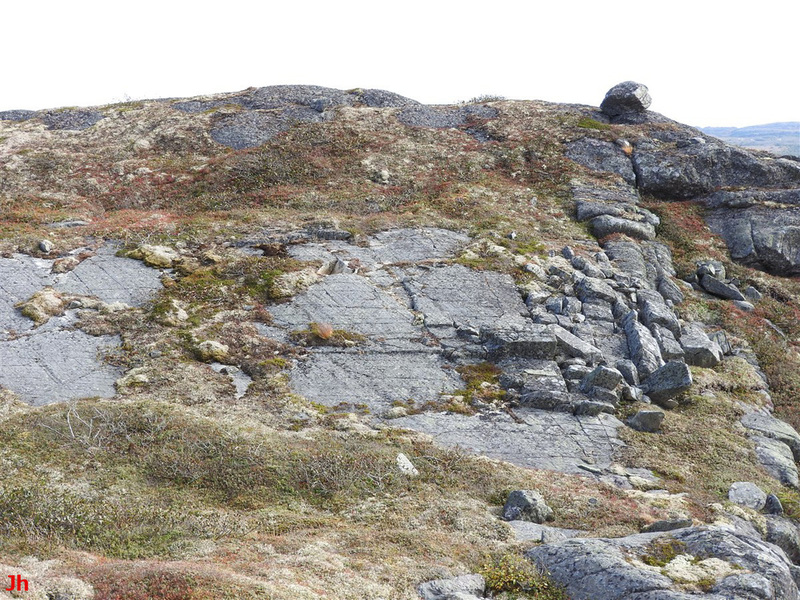 A smaller failure surface can be seen on the right, nearer the center, and then again on the left, just before the rock transitions to an area of frost-heave features. The small failure surface visible on the left forms one side of the fissure (5) described previously. The photo above shows a color-altered view of the south end of the ridge IF-01. 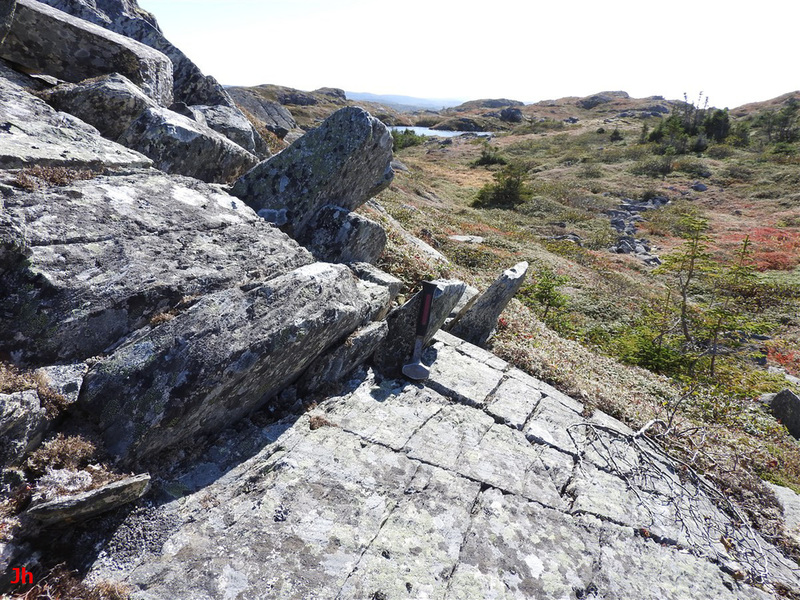 The purpose of the photo is to highlight the major cross joint that potentially played a role in supplying groundwater to the frost-heaved bedrock features seen at the left. Three surfaces carved out along the cross joint are shaded magenta in the picture. The distance separating the right and left shaded surfaces is about 10 m.
An oblique view of the south end of the ridge is shown above. 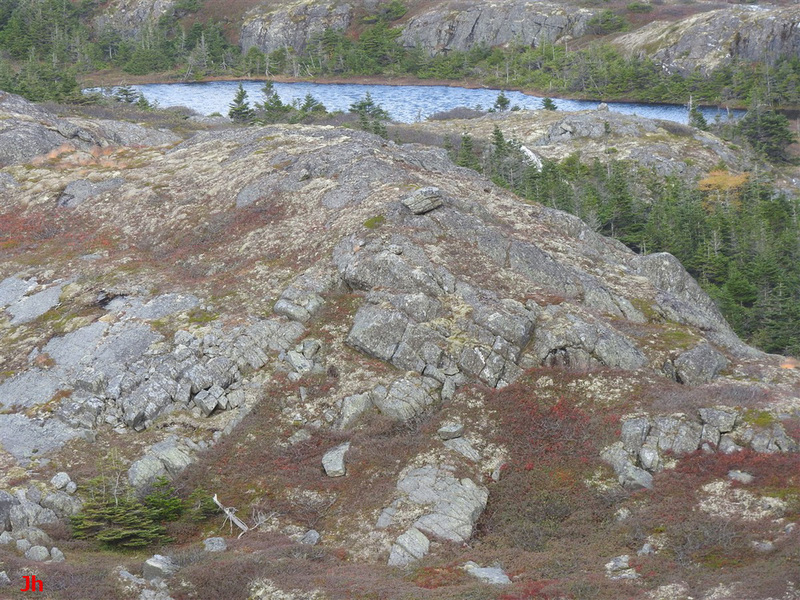 Near the center of the photo is a rectangular section of missing rock (area, now occupied by vegetation, is open to the bottom). 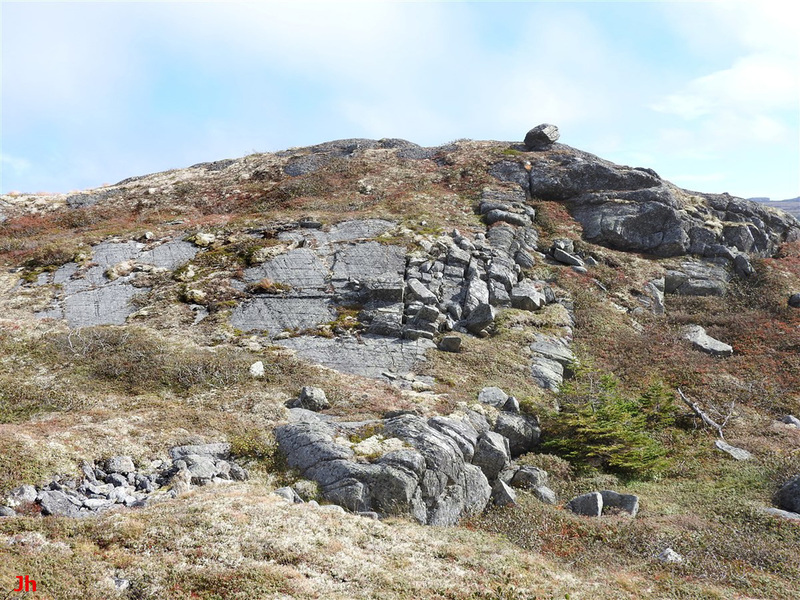 The missing section of rock, presumably removed by glacial erosion, is bounded on the left (north) side by the major cross joint shown in the previous photos. 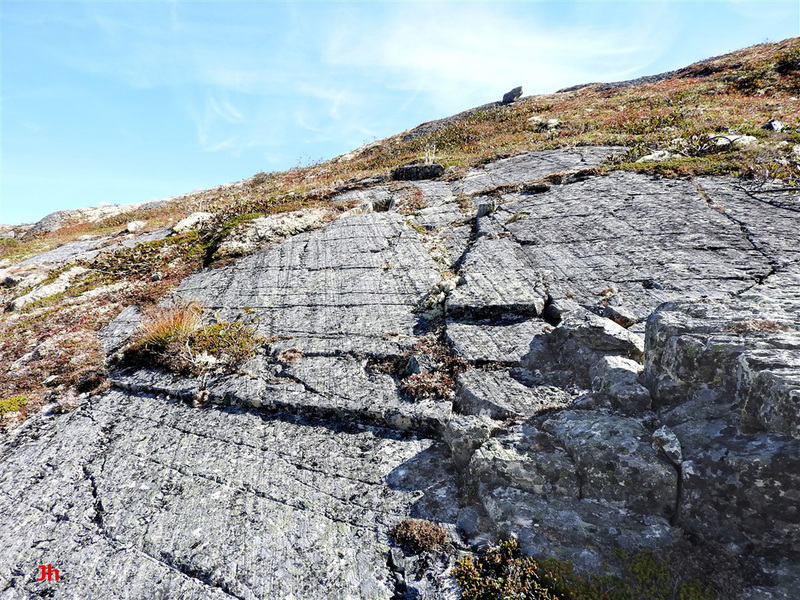 The photos above (first picture is a closeup of the top of the second) show the cross major cross joint, widened into a fissure (5) by frost wedging and then transitioning into a multitude of frost-disrupted bedrock features. 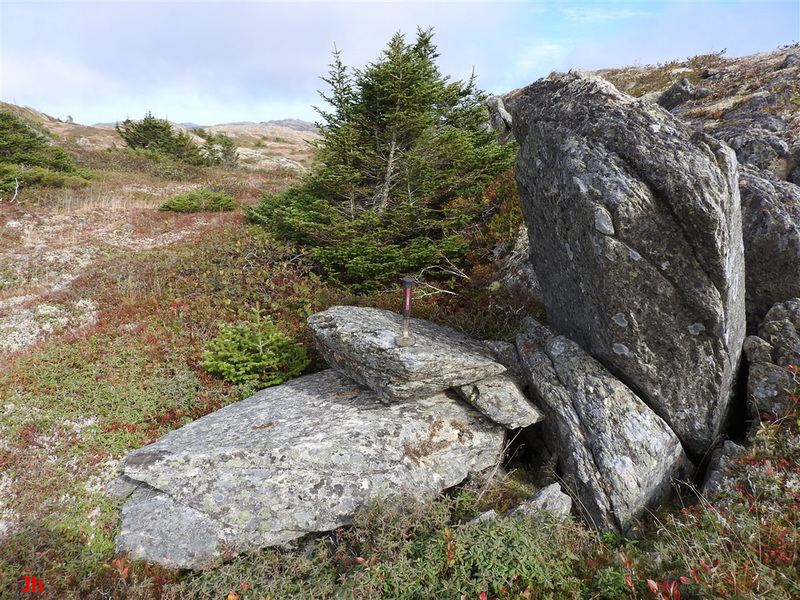 In summary, this site (IF-01) may demonstrate a link between bedrock frost heave and groundwater transferred from an up-ice location through large-scale joints in a bedrock ridge. The pressurized groundwater could have originated from glacial ice bearing directly on the east side of the ridge, or it could have originated from an area considerably further to the east. The second case is more in keeping with other observations from the local region. If the apparent frost heave was caused by artesian groundwater of glacial origin, and if the bedrock displacement occurred under glacial ice, then the overall process could be construed as glacial plucking rather than conventional frost heave. However the plucked formations were disturbed very little, indicating hindered glacial flow, motion by ice creep without basal slip, hence cold-based glacial activity. 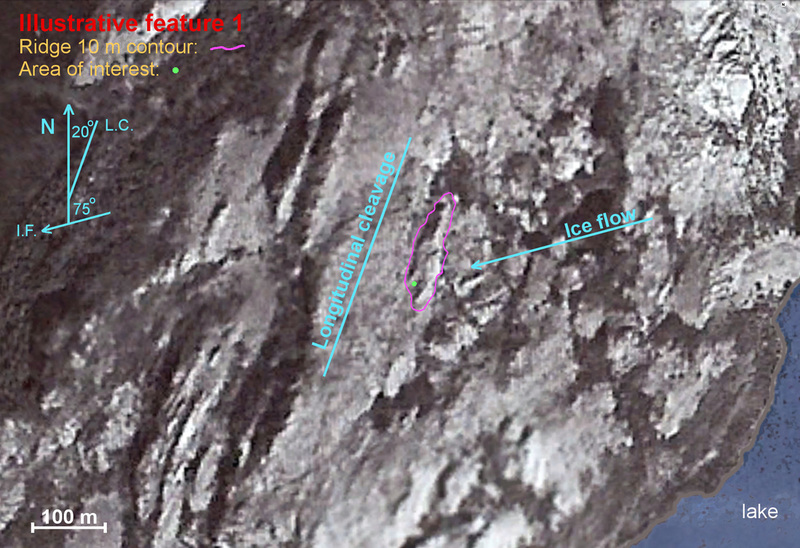 This Illustrative Feature provides an entry point for looking at other significant frost-heaved and plucked features in the surrounding neighborhood.